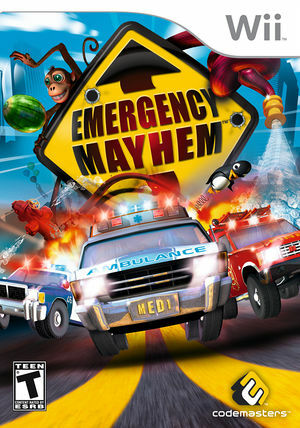 Emergency Mayhem mixes fast and frantic driving action with hilarious arcade mini games. Take charge of the three Emergency Services, you'll have to battle the traffic and shoot down shortcuts as you race from crazy catastrophe to daft disaster. At each incident, you'll use the Wii Remote in wacky ways to solve unique crises, from disarming bombs to herding escaped penguins! Hangs will occur starting during the intro, but also throughout game play. These can be worked around by underclocking the CPU under Config \ Advanced \ Enable Emulated CPU Clock Override. Even a small underclock (i.e. 90-95%) seems to resolve the hangs, and related high pitched audio squeals. The graph below charts the compatibility with Emergency Mayhem since Dolphin's 2.0 release, listing revisions only where a compatibility change occurred. This page was last edited on 4 February 2018, at 04:20.